I swear it's a coincidence. I didn't set out to read two novels by Stephan King that come down to a main character immobilized in a bed for an extended period waiting for doom. 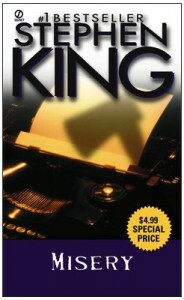 The first one I read, [b:Gerald's Game|32692|Gerald's Game|Stephen King|http://d.gr-assets.com/books/1297737756s/32692.jpg|4847031], was built in an entirely different way and how things came to be is quite different. In fact, other than the aforementioned similarity, the two books don't share much in common. It probably helps that this one, Misery, is much better than Gerald's Game. Annie might very well be the most compelling portrait of madness that King has yet written. She comes with a terrible, driving type of insanity that plods ever forward, but ebbs and flows in intensity. It's rare that I find myself reading a book and truly feeling like the hero of the story might not make it. I'm one of those horrible readers who has a terrible time forgetting that the hero is the hero and will always find a way out, some way. This one slowly slid that knowledge away from me, bit by bit, chapter by chapter. It ended up being one of the few times that Stephen King's legendarily weak endings didn't come into play. The ending worked and I'm glad.